KawaiiPunk - Kawaii Mascot Blog: Rudy Fig. Big Eyes Are Back! Rudy Fig. Big Eyes Are Back! A few months ago, as I’m sure many of you will remember, I posted a piece about Big Eyed Art and Kawaii Kids! (Re. Big Eyed Art and Kawaii Kids!). See? I told you I did! Anyway… in response to this uncharacteristically cultured post, and I say that with all due deference and respect to my fellow Mascots, I was recently contacted by a fellow big eyed connoisseur - and by that I mean a person that appreciates big eyed art, not a person with big eyes! Her name is Rudy Fig and, not only is she a fan of the aforementioned artistic movement, she’s also an extremely talented contemporary exponent of it! See what I mean? 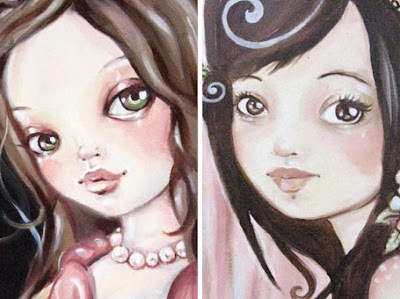 Rudy Fig is a 21 year old artist who, in her own words, and like many a great artist before her, “flunked out of art school in 2006 with flying colors”. A strange boast you may think? But is it? As someone who has always thought of the term “art school” as the ultimate oxymoron I have to say that I not only fully approve of Rudy’s actions, but would recommend them to budding artists everywhere! Not least because it means you don’t have to dress up in a ludicrous graduation gown at the end of term :) Believe me, nobody looks good in those things! Anyway, what the art school lost in Rudy’s dismissal, the art world gained in Rudy’s work. 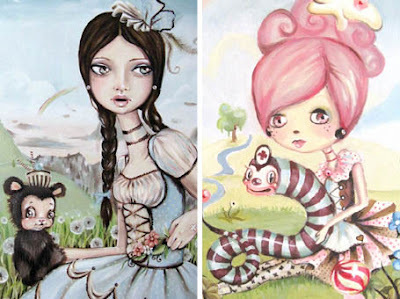 Her beautiful characters and landscapes drip with magic and enchantment. Doe eyed waifs and fantastical creatures sit side by side in idyllic dreamscapes that simultaneously comfort, delight and intrigue. There’s a very strange yet distinct sense, albeit a wholly inexplicable one, of warm familiarity to the worlds Rudy has created. A sense of having been there before, or even, as unlikely as it sounds, homecoming. For which we have to ask… why? Are these the worlds we all imagined and dreamed of as children? Has Rudy tapped into a subconscious memory we all unknowingly share? Or perhaps, as the Stereo Mascot suggests, have I just been listening to Pebbles Vol. 3 too much! Whatever the reason Rudy’s artworks resound so strongly, one thing is clear - resound they do! And, I’m more than happy to say, it’s not just me that thinks so! For despite her former art school’s short sighted summation of her talent, Rudy now works as a full time oil painter and custom toy artist. A fairytale ending that seems fittingly apt for her chosen subject matter! If you’d like to see more of Rudy’s work, and I’m sure you all would, then please pay a visit to her Flickr account. 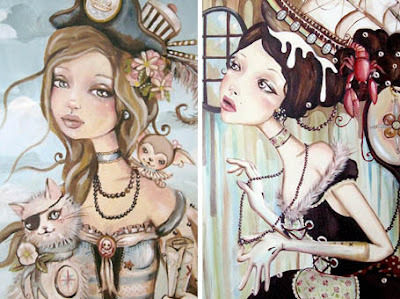 I am a huge fan of hers, both her paintings and dolls. I would love to get a custom Blythe doll by her one day. Magic Bean Buyer. Cute Clay Crafts! Unlucky Day for Unlucky Mascot! Hirobot at Tactical Urban Gears!